Source: CICH graphic created using data adapted from Adoption Council of Canada (personal communication with the Adoption Council of Canada), Human Resources Development Canada, Child and Family Services Statistical Report 1998-1999 to 2000-2001 http://www.pa-pa.ca/pdf/Child%20and%20Family%20Services%20Statistical%20Report%201998-1999%20to%202000.pdf(accessed March 18, 2017) and Citizenship and Immigration Canada as per Adoption Council of Canada website http://www.adoption.ca/ – accessed March 18, 2017. In 2001 there were 2,600 domestic adoptions in Canada. In 2008 there were 1,908 international adoptions. 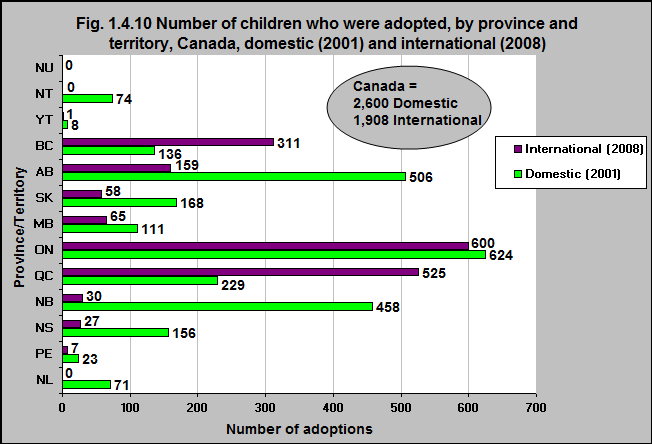 International adoptions were more numerous in Quebec, Ontario and British Columbia. 59% of all of the international adoptions were in Ontario and Quebec (combined). A further 16% were in British Columbia.